Employment was little changed in May, and the unemployment rate was 5.8% for the fourth consecutive month. On a year-over-year basis, employment grew by 238,000 or 1.3%, due to gains in full-time work. Over the same period, total hours worked were up 2.0%. In May, employment decreased for people in the core working ages of 25 to 54. It increased for people aged 55 and older, and was little changed among youth aged 15 to 24. Employment increased in Prince Edward Island, while it decreased in British Columbia and Nova Scotia. There was little change in the other provinces. There were employment increases in four industries in May: accommodation and food services; professional, scientific and technical services; transportation and warehousing; and finance, insurance, real estate, rental and leasing. At the same time, employment declined in health care and social assistance, manufacturing, construction, and "other services." There was little change in the number of employees in both the private and public sectors, as well as the number of self-employed workers. For people in the core working ages of 25 to 54, employment fell among both men (-19,000) and women (-19,000). The unemployment rate for men in this age group held steady at 5.0%, while it increased by 0.2 percentage points to 4.9% for women. In the 12 months to May, employment among core-aged men grew by 33,000 (+0.5%), the slowest year-over-year growth for this group since November 2016. Employment increased by 40,000 (+0.7%) for core-aged women on a year-over-year basis. Among people aged 55 and older, employment increased by 29,000 in May, bringing year-over-year gains to 173,000 (+4.5%). The unemployment rate for this age group fell 0.2 percentage points in the month to 5.1%. Employment was little changed among youth aged 15 to 24 on both a monthly and year-over-year basis. The unemployment rate for this age group held steady at 11.1% in May. Employment in Prince Edward Island increased by 800 in May, while the unemployment rate fell by 1.9 percentage points to 9.3%. Compared with 12 months earlier, employment in the province was little changed. In British Columbia, employment fell by 12,000 in the month. For the first time since May 2015, employment in British Columbia recorded virtually no growth on a year-over-year basis. The unemployment rate was little changed compared with the previous month, at 4.8% in May. The number of workers in Nova Scotia was down by 3,600 in May, and the unemployment rate increased by 0.5 percentage points to 7.2%. On a year-over-year basis, employment was little changed. 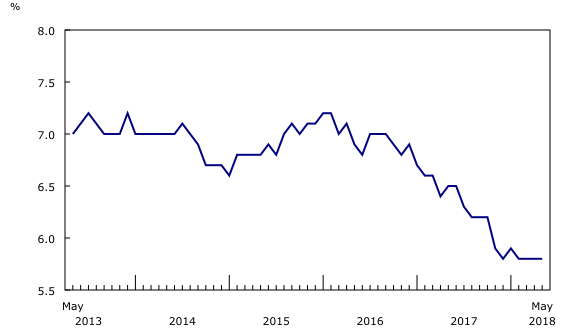 Employment in Quebec was little changed in May, as a decrease in full-time work was offset by more people working part time. The unemployment rate was little changed at 5.3%. In the 12 months to May, employment in the province increased by 65,000 (+1.6%). In Ontario, there was virtually no change in the number of people working in May, and the unemployment rate was 5.7%. On a year-over-year basis, employment in the province was up by 126,000 (+1.8%). In accommodation and food services, employment rose by 18,000 in May, driven by growth in British Columbia. Employment gains in April and May accounted for more than half of the year-over-year increase (+56,000 or +4.7%) in this industry. Employment in professional, scientific and technical services rose by 17,000 in May, entirely due to gains in Ontario. On a year-over-year basis, employment in this industry was up by 31,000 (+2.1%). There were 12,000 more people working in transportation and warehousing in May, bringing the year-over-year increase to 42,000 (+4.5%). Employment in finance, insurance, real estate, rental and leasing rose by 12,000, almost entirely in Quebec. Despite this increase in the month, the number of people working in this industry was similar to that observed 12 months earlier. There were 24,000 fewer people working in health care and social assistance in the month, while employment was little changed on a year-over-year basis. Manufacturing employment was down by 18,000 in May, and was virtually unchanged compared with 12 months earlier. Employment in this industry reached a five-year peak in December 2017, and has been trending downward in 2018. Employment in construction fell for the second consecutive month, decreasing by 13,000 in May. Employment was little changed from 12 months earlier, with recent declines offsetting gains observed in late 2017. Employment in "other services" fell by 12,000 (-1.5%) in May and was little changed on a year-over-year basis. "Other services" includes services related to civic and professional organizations, and private households. There was little change in the number of employees and the self-employed in May. On a year-over-year basis, there were increases in the number of public sector (+84,000 or +2.3%) and private sector (+105,000 or +0.9%) employees, while the number of self-employed was little changed. From May to August, the Labour Force Survey collects labour market data on youths aged 15 to 24 who were attending school full time in March and who intend to return to school full time in the fall. The May survey results provide the first indicators of the summer job market, especially for students aged 20 to 24, as many younger students are still in school. Data for June, July and August will provide further insight into the summer job market. Published data are not seasonally adjusted, therefore comparisons can only be made with data for the same month in previous years. Compared with 12 months earlier, employment among 20- to 24-year-old students was virtually unchanged in May. The employment rate (57.0%) and unemployment rate (13.6%) for this group of students were also little changed compared with May 2017. In May, there were 33,000 (-7.3%) fewer 17- to 19-year-old students employed compared with May 2017, entirely due to a decrease in part-time work. As there was a similar decrease in the population of students in this age group, there was little change to their employment rate at 49.9%. The unemployment rate for this younger group of students was also little changed at 14.6%. Adjusted to the concepts used in the United States, the unemployment rate in Canada was 4.8% in May, compared with 3.8% in the United States. In the 12 months to May 2018, the unemployment rate fell by 0.8 percentage points in Canada and by 0.5 percentage points in the United States. 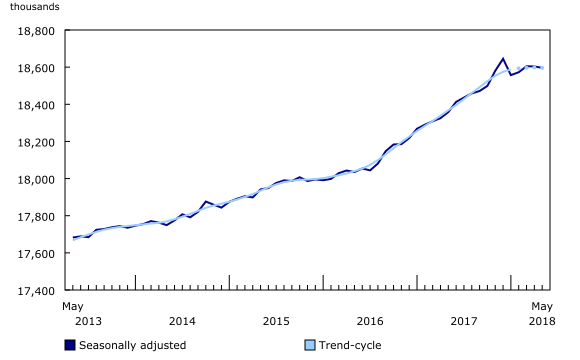 The labour force participation rate in Canada (adjusted to US concepts) was 65.1% in May compared with 62.7% in the United States. On a year-over-year basis, the participation rate decreased by 0.6 percentage points in Canada, while it held steady in the United States. The US-adjusted employment rate in Canada stood at 62.0% in May compared with 60.4% in the United States. On a year-over-year basis, the employment rate edged down by 0.1 percentage points in Canada and increased by 0.4 percentage points in the United States. For further information on Canada–US comparisons, see "Measuring Employment and Unemployment in Canada and the United States – A comparison." The Labour Force Survey (LFS) estimates for May are for the week of May 13 to 19. Chart 1 shows trend-cycle data on employment. These data represent a smoothed version of the seasonally adjusted time series, which provides information on longer-term movements, including changes in direction underlying the series. These data are available for the national and provincial employment series in table 14-10-0287-01, and for national employment by industry in table 14-10-0355-01. For more information, see the StatCan Blog and Trend-cycle estimates – Frequently asked questions. The next release of the LFS will be on July 6. A more detailed summary, Labour Force Information (Catalogue number71-001-X), is now available for the week ending May 19. The product Labour Market Indicators, by province, territory and economic region, unadjusted for seasonality (Catalogue number71-607-X2017002) is also available. This dynamic web application provides access to Statistics Canada's labour market indicators for Canada, by province, territory and economic region and allows users to view a snapshot of key labour market indicators, observe geographical rankings for each indicator using an interactive map and table, and easily copy data into other programs. To enquire about the concepts, methods or data quality of this release, contact Martha Patterson (613-299-3942; martha.patterson@canada.ca), Emmanuelle Bourbeau (613-951-3007; emmanuelle.bourbeau@canada.ca), or Client Services (toll-free: 1-866-873-8788; statcan.labour-travail.statcan@canada.ca), Labour Statistics Division.